The AKGAP species modeling team began selection of environmental predictor variables by deciding which factors would potentially affect the distribution of species in each of the three vertebrate classes (i.e. Mammalia, Amphibia, and Aves). General categories considered were geological, hydrological, physiographical, ecological/biological, anthropogenic, and climate factors. We then investigated a suite of data sources and reviewed these for availability of relevant data of reasonable resolution (<1-km) at the statewide scale. We defined key attributes (e.g. distance to wet vegetation) and the units (e.g. meters) for each variable. We then standardized the coordinate systems to datum of NAD 1983 and projection of Alaska Albers. In situations where geographic transformations from original datums (i.e. NAD27, Clarke 1860, WGS84) were required, we used the best conventional ESRI transformation methods available for the statewide scale of Alaska. Because these methods uniformly applied a transformation algorithm across the very large longitudinal and latitudinal extent of Alaska, some offsets (~90+60m) were observed at the extreme margins of the state and accepted as inherent biases of these data. 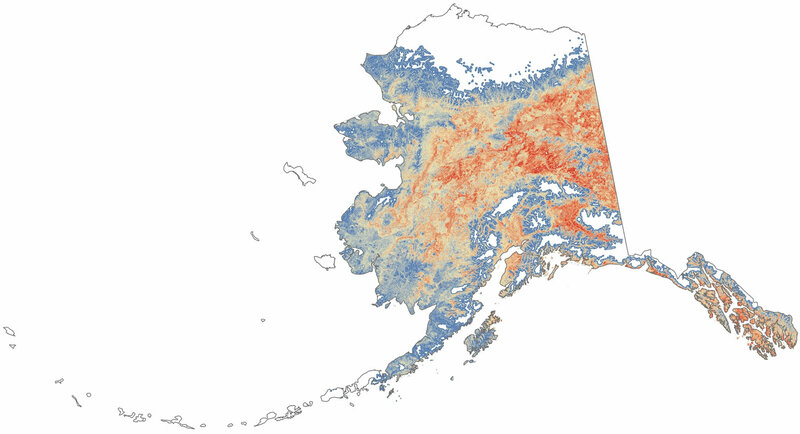 Variables were run through a filtering process to standardize the modeling extent to a region consisting of the entire mapped land surface of Alaska plus a zone extending from the coastline. Forest edge and ecotone was one of the ancillary datasets developed for inductive and deductive species habitat modeling.